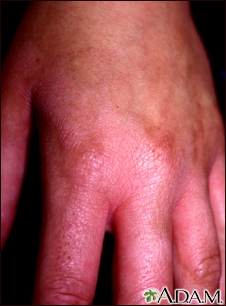 This person is sensitive to chemicals used in perfumes, and now develops a rash when the area is exposed to light (photocontact dermatitis). These perfumes include Oil of Bergamot, an oil also found in some citrus fruits and wild plants. It results in streaky redness (erythema) and pigmentary changes.